I think one of the more enjoyable experiences parents have is taking their kids down the toy aisle of a store and letting them pick a toy that they really want (as long as your child isn’t screaming). When my wife and I were expecting our second child, we let our son pick something out so he wouldn’t feel left out. He decided on the Little People’s Zoo Train and has been very happy with his decision ever since. As parents, we have had nothing but good experiences with this toy. To learn more about our experiences, and our son’s experiences, please read on! * This is my son’s version of this toy! This is a really fun orange, red, blue, and yellow toy train that has a manufacturer’s recommended age of 1-5 years. 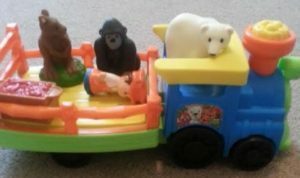 The train is connected to an open car/trailer that allows you to place animals or other toys into the back and drive them around. Even young children will enjoy pushing the train all over your home. It moves really well on tile flooring and even carpet, so my son likes to race it against his other cars. Sometimes the animals come flying out the back, but no real damage seems to happen to them. The train itself is also really durable, it has been involved in many train wrecks and it doesn’t have a single scratch on it! 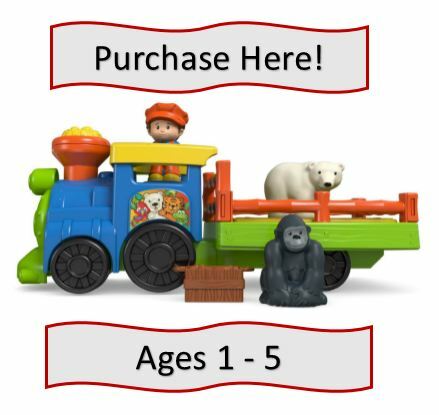 The set comes with the train, conductor, gorilla, polar bear, and a pack of food for the animals. What is neat is that any of the animals or the conductor fit in the driver’s seat. My son’s personal preference is to have the polar bear drive and the conductor sit in the back with the gorilla. I am not sure if a polar bear driving meets safety regulations, and I hope the conductor will be okay with the gorilla, but we haven’t seemed to have any major accidents yet. The train has a smoke stack that can be pushed to make different train noises. The train car can also be pushed down to sing different songs, and it makes different animal noises when it moves. This is another Little People toy that scores really well on the potential danger scale. There are no small or potentially sharp parts, and it is made really well preventing any potential breakage. What could potentially happen that could cause problems? Maybe your child throws a temper tantrum and tosses the animals, conductor, or train at someone. Luckily trains aren’t supposed to fly, so as parents we can correct that behavior quickly and efficiently. The one surprising situation that I didn’t see coming was my son trying to stand on the trailer part of the train, and use it like a roller skate. As you can imagine, the toy really isn’t made for that and it’s really hard to keep your balance. The good news is, he didn’t crash into anything so no damage was done. He also hasn’t attempted that technique again since the fall. We give this toy a 3 out of 10 on our scale. Something very strange would have to happen for any injuries to occur with this toy aside from the potential situations listed above. Maybe an adult slipping on it in the middle of the night and falling down the steps? I saw that on a cartoon once. For a toy that makes a lot of noise, it actually scores relatively low on the adult annoyance scale. A big reason for that is it makes a variety of sounds – which includes one main theme song and multiple animal noises. Don’t tell my wife this, but the party song is actually a little catchy going something like this: “All aboard. Choo Choo! Climb aboard the zoo train. We say hello to all the animals. Hear them growl and hear them chirp and hear them roar. (Animal noises) It’s a party on the zoo train so move just like the animals. So wave your arms and clap your hands and stomp your feet. Chugga chugga chugga chugga choo choo.” I am probably off by a few words, but well done Fisher-Price. The variety of sounds, lower volume, and the fact that it rotates songs every time it moves makes this toy much less annoying than the Little People Toy Airplane we reviewed earlier. Our son has enjoyed this toy for a long time, and I really don’t have a lot to complain about. For those reasons, we give this item a 5 out of 10. There are some additional animals that can be purchased for this toy. They can take turns riding in the back, or driving, the train! We purchased the kangaroo because our son loves to yell hop and jump around like kangaroo. Honestly, he likes any animal that jumps. The animals are also well built and can be played with on their own, independently from the train itself. Our son really loves this toy because he can race it, crash it, because it sings catchy songs, and most importantly he loves animals. 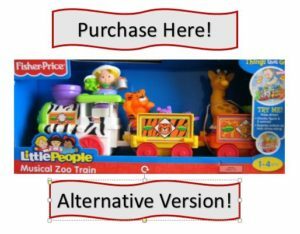 For children that love animals, trains, cars, or just like to use their imaginations, I would highly recommend this toy! Don’t be suprised if this becomes an all-time favorite, so we give it gold star staus (or yellow because it is brighter).